thedevotedwoman: what child is this? At this very moment, an expectant mother has just gone into labor. After long months of waiting for her pregnancy to come to fruition, a woman is about to introduce a new child into the world. Perhaps this child's birth will come easily and without complication. Perhaps it won't. Perhaps this baby will be physically healthy and raised in a comfortable, safe environment filled with love and family. Perhaps it won't. Perhaps it will be raised in poverty and faced with malnutrition, a lack of education, sickness and danger. The speculated debut of every infant causes me to rejoice at God's creation and purpose yet still consider all that is most worrisome about the condition of our sinful race. Lord, will this baby make it? In only a few years, as you and I continue to grow old, this once tiny infant will grow up and become wise to the saddened state of mankind. They will learn of how wealth and resources are divided unjustly on virtually every continent. They will be faced with real issues such as unstable economies, corrupted leaders, and war between nations. They will involuntarily be joined in responsibility for the choices of mankind. Choices that will impact the freedoms, opportunities, dignity and welfare of every son and daughter... every brother or sister... every man and woman. This new life, added to the billions of other lives sharing our dying planet, will earn their place in history merely because they are human. They may be famous. They may be renowned. They may be wealthy. They may hold authority. Or they may never show up on the radar. A nobody to the masses. Irrespective of who they become or how easy/difficult their life may prove, this person will one day find himself face-to-face with Jesus, Emmanuel (meaning "God with us"), the Prince of Peace, the Son of God, the Light... the Hope of the world. Jesus... a person who also was once a random baby born unpretentiously into our tainted world. Jesus... who would later be known as a Teacher, a Prophet, a Healer, a Messiah. What child is this who's birth was both lowly and glorious? A child who's arrival would ultimately be celebrated annually and worldwide. A child who's life would motivate carols of rejoicing and hymns of joy and peace. 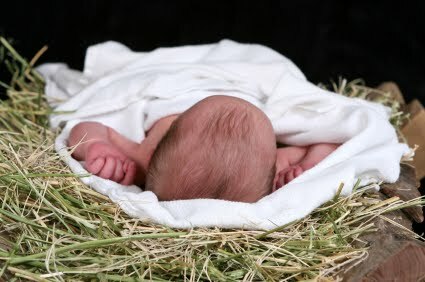 A child who was, and is, and is to come - the King of all kings. A special baby in whom all others will measure time. A person who could not be ignored. A person who would share a quality of spirit, a depth of insight, a manner of love while inviting others to live as He lives with great compassion, faith, purpose, and ethical integrity. Jesus would show us the highest possibility of godliness and the lowest form of humility. He would petition every heart to follow His Way, His Truth, His Life. A life that focuses on things ahead... things eternal... things holy... things good. This, this is Christ the King, whom shepherds guard and angels sing! A child who slept in straw and lay in a manger - a trough where cattle would eat. A God who would bring promise, redemption, healing, salvation. Here he would come to live, to die, and to live again to give hope to all babies... to all men born of this hopeless world. What unique child is this that we should celebrate his birth and sing his arrival - an arrival closer in circumstance to the poor than to the more fortunate. An arrival that warranted the choirs of heaven to sing glory and praise to God in the Highest the moment the umbilical cord was cut from His virgin mother. An arrival that invited both the simple and the sage... the worker and the wise... the elegant and the ordinary. All who knew would come and give their blessing to the One who was, and is, and will forever be truly blessed. Friends, as the hustle and bustle of the holiday season consumes our time and focus, let us not forget to honor this holy, holy, holy child... this Savior, who came to earth for one goal, one purpose. As Christ followers, let us be grateful that our eyes have been opened to His grace. Let us be thankful that our lives hold great worth because He first loved us. Let us share what we know to be true. What we believe, accept, and follow. Yes, let us tell all people about Jesus' one way, one goal, one purpose and how He loves all mankind and wishes to redeem their lives. Let us sing whole-heartedly alongside the angels and eternally rejoice - for peace has come to earth! All praise and glory to our Omnipotent, Almighty God who loved us enough to come. Forever let us worship Jesus Christ... our Savior, who lowered Himself to our level so that we could ultimately be lifted back up to His. What child is this? This child is my Master and King. This child is my Redeemer and Ruler. This child is my Shepherd and Comforter. This child is my Wonderful Counselor. My Mighty God. My Everlasting Father. My Prince of Peace. The Holy of Holies!!! Let us pause and celebrate His glorious nativity. Let us live with His message, His purpose spilling from our lips. Let us rest in His promise to return again, and anticipate with hope His kingdom come! This, this is Christ MY King... my precious, holy, beautiful, magnificent JESUS! O Come, let us pause. O Come, let us adore HIM!